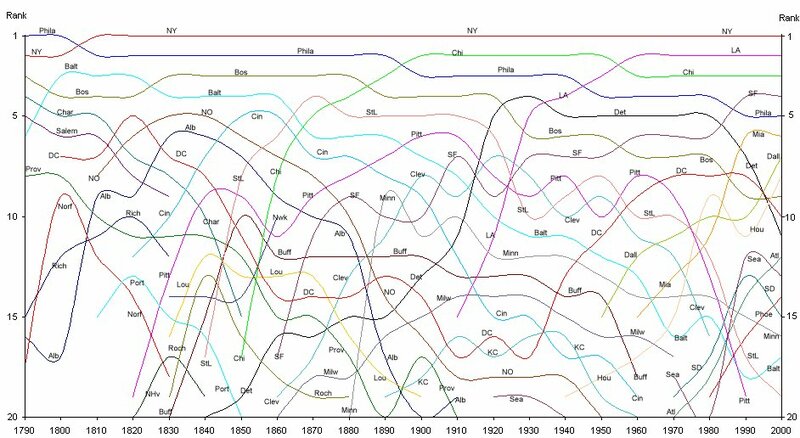 The graph and tables on this page attempt to show how the urban hierarchy of the United States has developed over time. The statistic used here is the population of the metropolitan area (contiguous urbanized area surrounding a central city), not the population of an individual city. Metropolitan area population is much more useful than city population as an indicator of the size and importance of a city, since the official boundaries of a city are usually arbitrary and often do not include vast suburban areas. For example, in 2000 San Antonio was the 10th largest city in the U.S., larger than Boston or San Francisco, but its Metro Area was only ranked about 30th. The same thing was happening even back in 1790: New York was the biggest single city, but Philadelphia plus its suburbs of Northern Liberties and Southwark made it the biggest metro area. Continue reading at Peakbagger . . .
Republished from Greater Greater Washington. I wanted a nerdy planning-related poster for my wall (other than the periodic table of city planning), so I made one this week. I scoured Google Earth and measured that quintessentially American grid in about a hundred downtowns around the country. Click for the poster-quality version (large PDF). Exploring these grid proportions messed with my preconceptions. I assumed the more western and newer cities would have larger grids than the more eastern and older cities, but no obvious pattern is discernible to me. Mobile, AL, settled by French colonists in the early 18th century, Tulsa, OK, a 19th century farming town, and Anchorage, AK, a 20th century frontier town, all share the same 300′ x 300′ internal block (street widths vary a little). 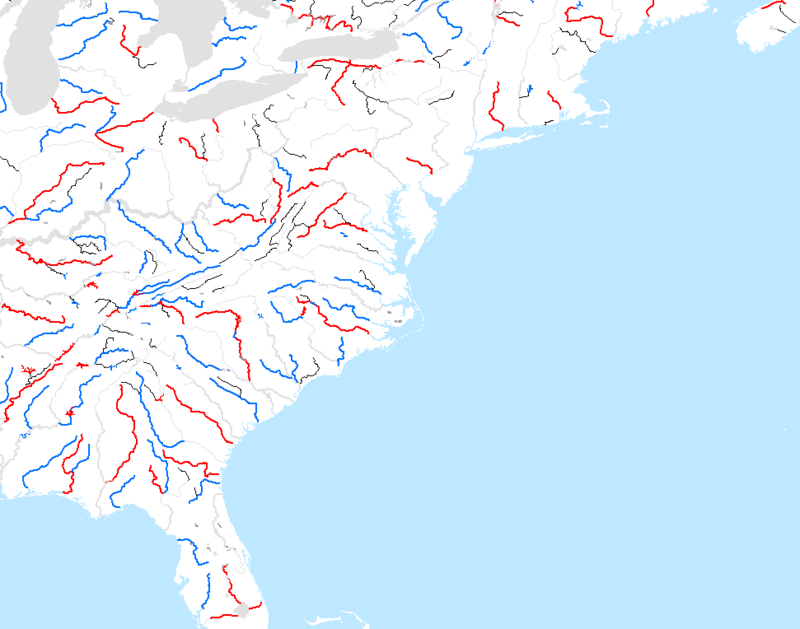 What compelled the early settlers of these towns to choose, say, 220′ over 440′ lengths? I can’t say I have any idea right now. Manhattan is also a curious story. According to Witold Rybczynski, the expanding nation unequivocally chose the 1811 Commissioner’s Grid of New York City over L’Enfant’s baroque-influenced plan for Washington, DC as the model for new towns. While this is surely true, it begs the question: why are New York’s long and skinny blocks not found anywhere else in the country? You would think at least one group of western settlers would seek to emulate their home town of New York more exactly. I’m leaving aside the interesting value questions around block size. Ever since Jacobs, conventional wisdom has held that smaller blocks are preferable for walkability, but urban designer Fannis Grammenos challenges the grid somewhat in a Planetizen post. 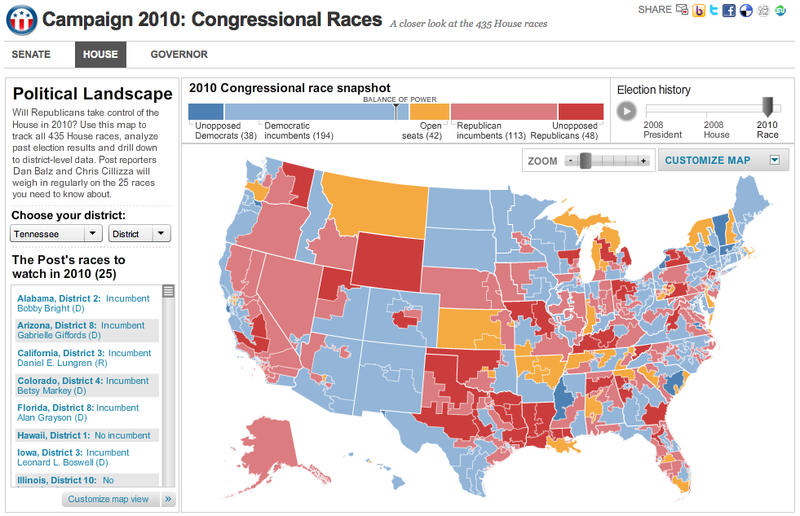 Will Republicans take control of the house in 2010? 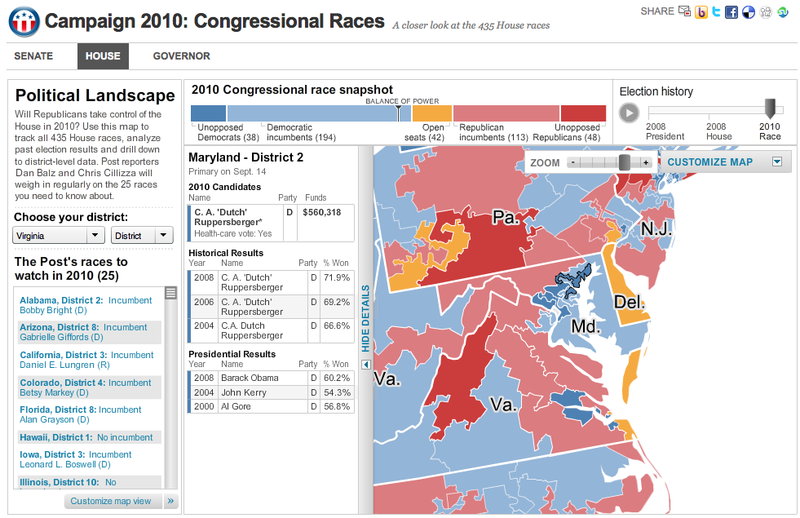 Use this map to track all 435 House races, analyse past election results, and drill down to district level data. 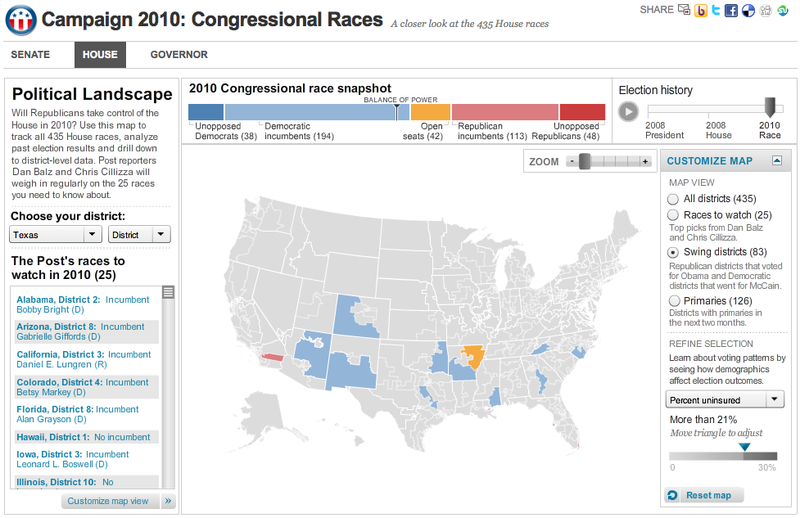 Post reporters Dan Balz and Chris Cillizza will weigh in regularly on the 25 races you need to know about. SOURCES: Federal Election Commission, U.S. Census Bureau. Interact with the original at The Washington Post . . .
Two more screenshots, showing generalized urban area linework in the Washington, DC, metro area with thematic attribute “details” panel open and then the advanced filtering options, in this case to pull out swing districts that have rate more than 21% uninsured. Republished from the New York Times. Nov. 18, 2009. 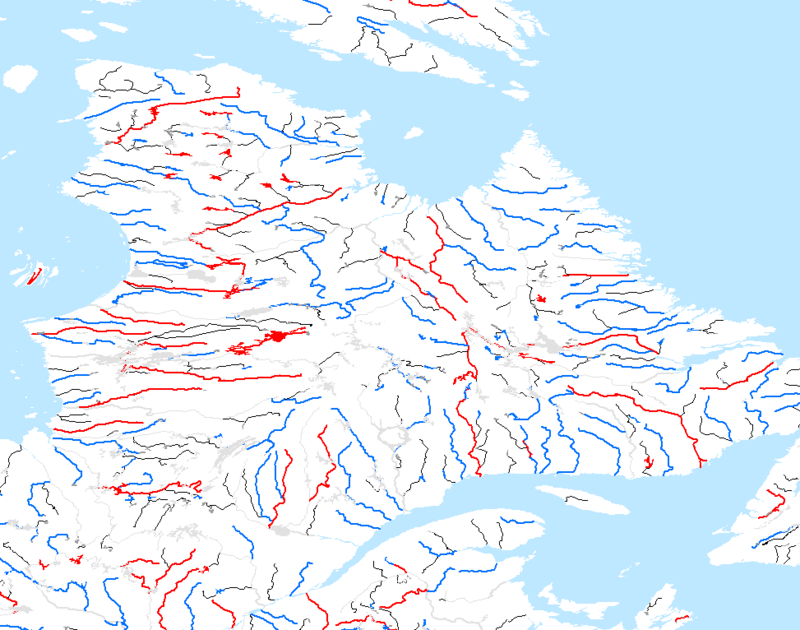 Tom and I have been busy adding 4 times the rivers and 3 times the lakes we had for North America. 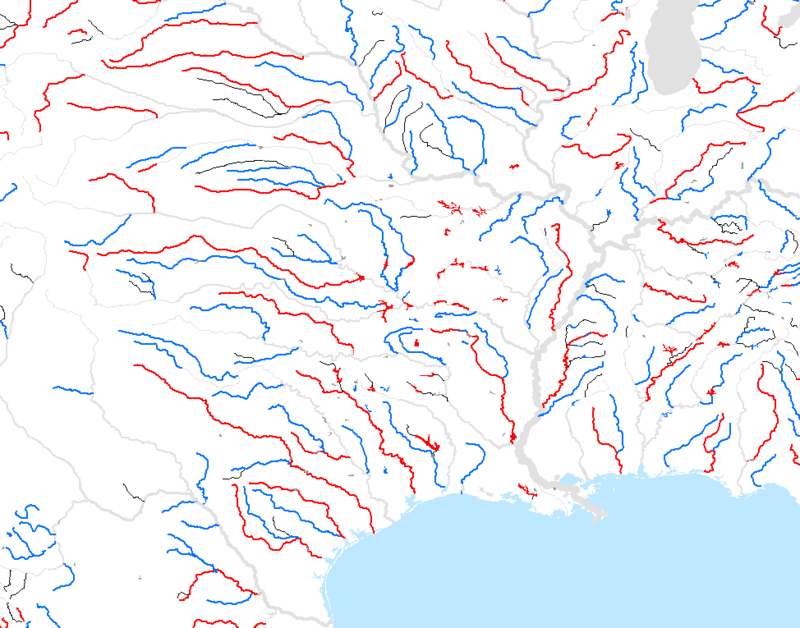 This adds in many “missing” hydro features that one might normally find on a 1:10,000,000 hydrologic reference map. Why were they missing from the first version of Natural Earth? It’s hard to wade thru 1:1,000,000 features to figure which to add and an even tougher job to attribute them with the correct name and scale ranks. 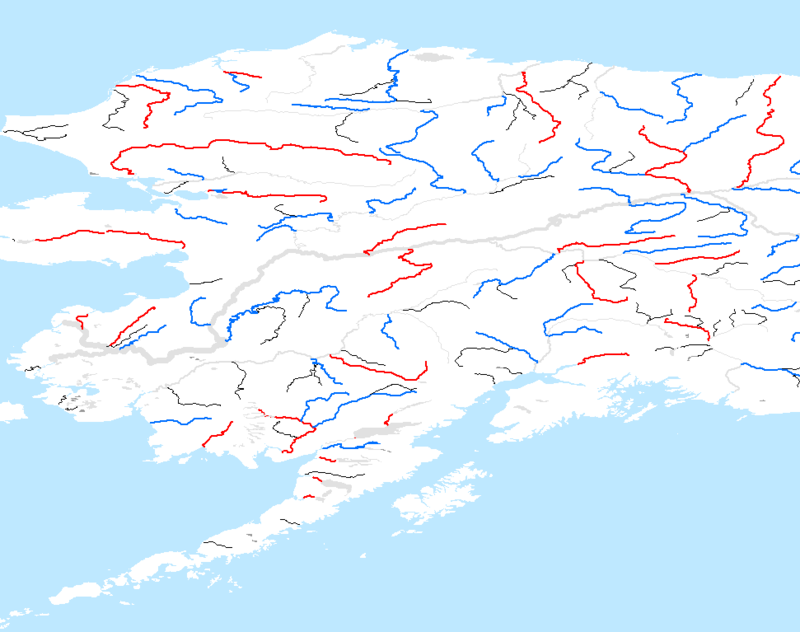 There’s another factor: these extra features are great if you’re making a watershed map, but can be a little noisy when used as a background layer in say a political reference map. Cody Rice, now of the EPA but formerly of the Commission for Environmental Cooperation (CEC) send along an amazing link last week. 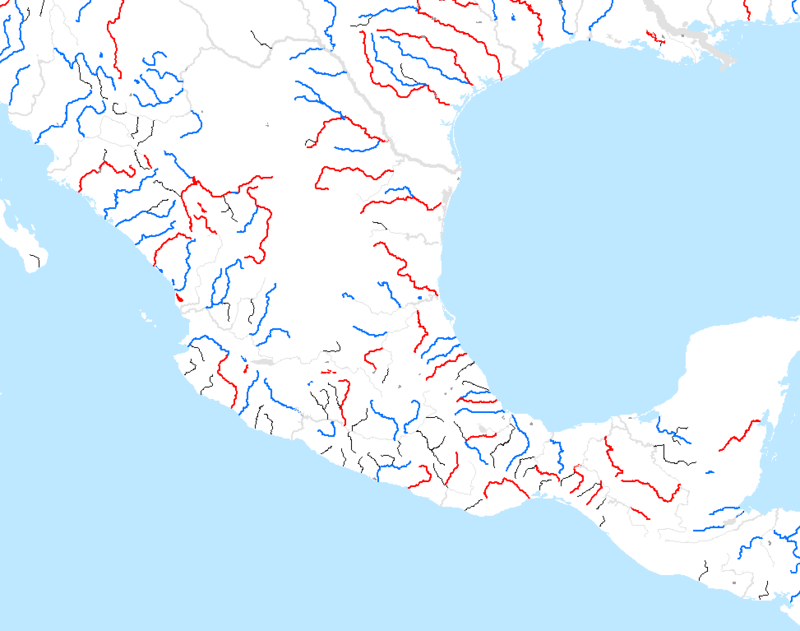 The CEC is a joint agency between the United States, Canada, and Mexico. Specifically: USGS, Natural Resources Canada, INEGI-Mexico. Each country contributed base data for a 1:10,000,000 digital atlas. 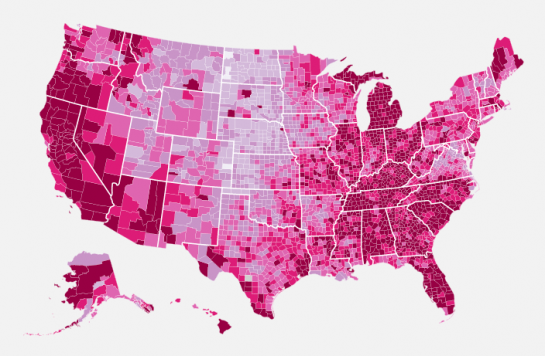 The data is available in many popular formats and is in the public domain. 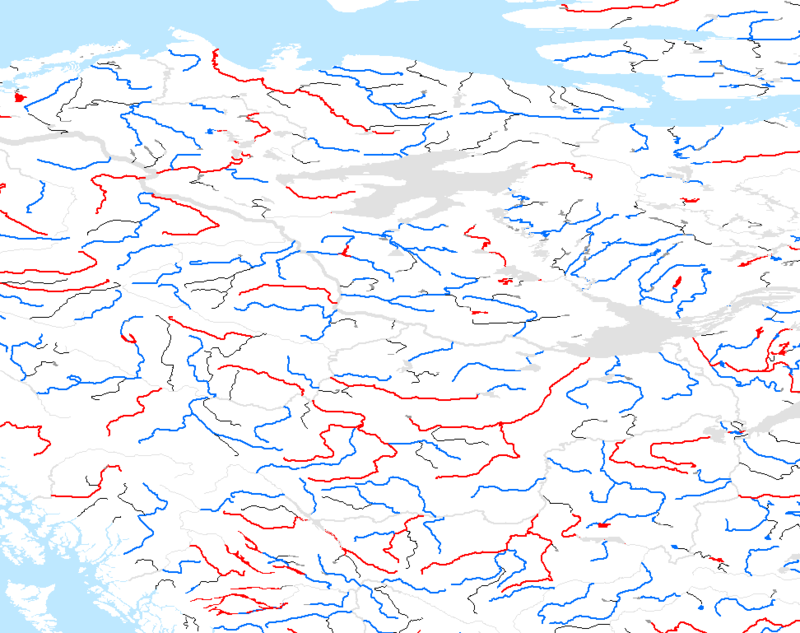 Better yet, it includes GIS data attributes like river name! We’ve compared with our existing Natural Earth linework and identified which features were missing. For those we’re adding, we’ve adjusted the new linework a nudge here and there so it lines up with SRTM relief and our existing linework. 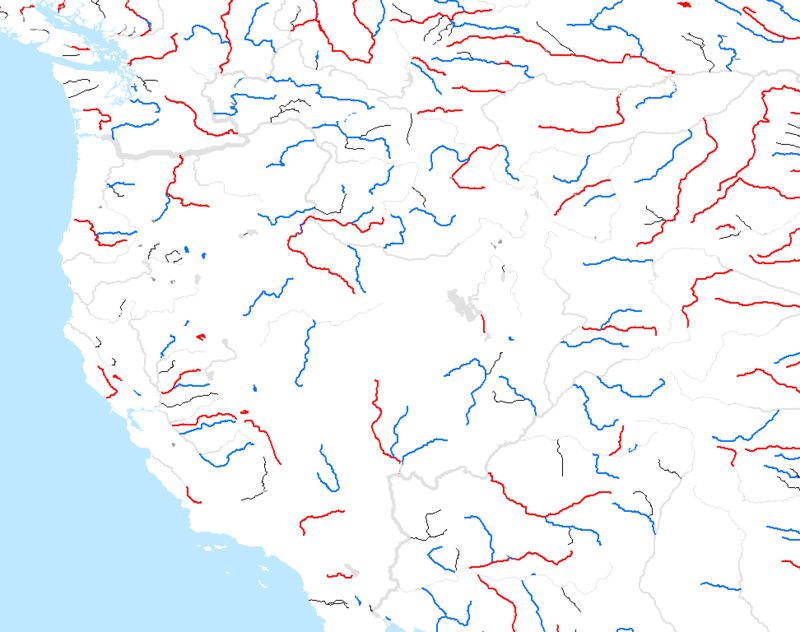 We’ve also gone thru and created lake centerlines and applied scale ranks to all in three new steps (10, 11, and 12). We have some final polishing but will be releasing, along with some slight adjustments to the original data, by the end of January. Do you have time to donate? Unlike ranks 0 to 9 (the original data), this new data will NOT come tapered. We’d like it to be and can show you how. Know of a similar, attributed with name, 1:10,000,000 regional dataset we could adapt into Natural Earth to build out our coverage? 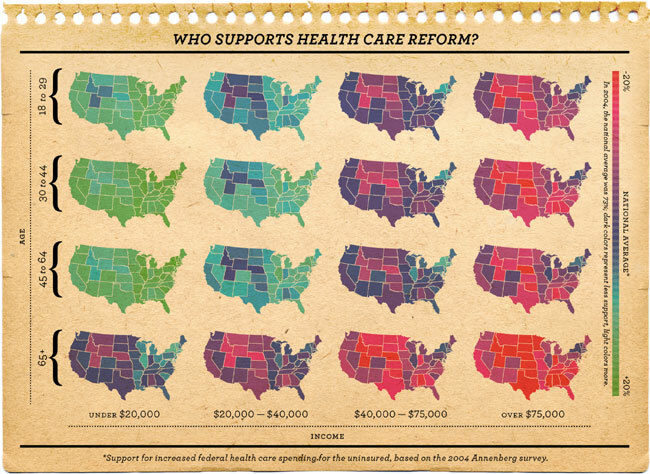 Please let me know at nathaniel@kelsocartography.com. Red = new at rank 10. Blue = new at rank 11. Black = new at rank 12. Grey = old at ranks 0 to 9. Click images to view larger sizes. Chinese companies banned from doing business in the U.S. for allegedly selling missile technology to Iran continue to do a brisk trade with American companies, according to an analysis of shipping records. A unit of state-owned China Precision Machinery Import-Export Corp., for example, has made nearly 300 illegal shipments to U.S. firms since a ban was imposed on CPMIEC and its affiliates in mid-2006, according to an analysis of shipping records by the Wisconsin Project on Nuclear Arms Control, a nonprofit proliferation watchdog. A Wall Street Journal review of the records and interviews with officials at some of the American companies indicate that the U.S. firms likely were unaware they were doing business with banned entities, and in many cases were tripped up by altered company names. The CPMIEC shipments, worth millions of dollars, include everything from anchors and drilling equipment to automobile parts and toys. In many cases, CPMIEC acted as a shipping intermediary — activity also banned under a 2006 presidential order. The ability of CPMIEC and other foreign companies to continue doing business in the U.S. despite the sanctions comes as the Obama administration considers fresh economic sanctions against Iran. The illegal shipments suggest that U.S. sanctions have become so numerous and complex that they have become difficult to enforce. Continue reading at the Wall Street Journal . . . 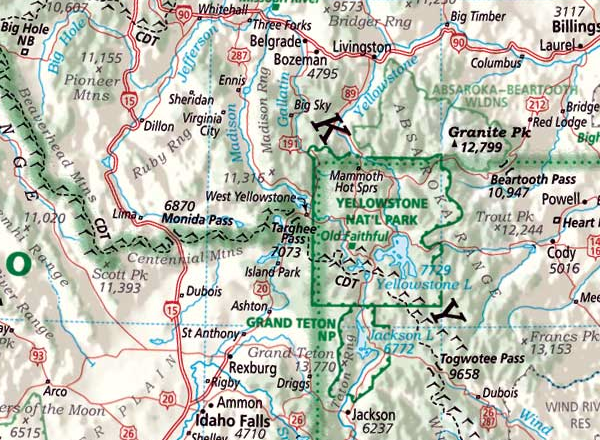 Interact with the original at Free Geography Tools . . .
Republished from the Cartogrammar blog. Recently I’ve heard two friends independently inquire about some sort of basic guide for loading and drawing a shapefile in Flash. The only real tutorial/example I can recall is here, dealing with Google Maps. But these guys are looking for something more bare-bones. Being a regular user of Edwin van Rijkom’s invaluable code libraries for reading shapefiles, and usually forgetting the process myself, I thought it would be a good idea to put together a very simple set of AS3 classes that load a shapefile and throw a map on screen. I hope that this class (and the several associated classes) can both be directly usable for some projects and serve as a basic guide to using van Rijkom’s classes to load shapefiles. An example that loads and displays a US states shapefile (and then puts a square on my house and colors the state of Wisconsin green). View the source code here.